I was just dying for a pizza the other day, but not any kind… I was craving for the pizza my mom used to make me when I went home for holidays. I remember how amazing it smelled when she took it out of the oven… and the taste! I wouldn’t even put ketchup or garlic sauce on top, it was that good! I don’t know what made me remember all this, but I just had to cook one of those divine pizzas. And what do you know? 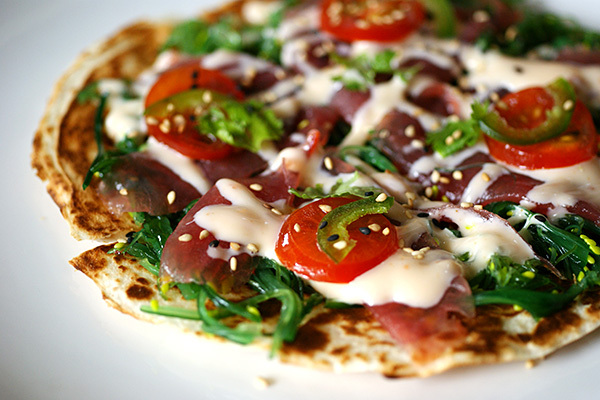 My usual recipe inspiration, busycooks.about.com, had a tuna pizza recipe in their survival food recipes category. I didn’t have any tuna cans in the pantry, but I went to the store and got four. This way, I’ve updated my stockpile with a new type of canned food. 1. It’s very nutritious: “You always hear about eggs and various meats being a high source of protein, but what about fish? One of the nutritional highlights of tuna is its high protein content. How high in protein content? Try 23 grams in a serving size of three and a half ounces. Talk about a good source of protein to help keep those muscles strong. Protein is also good for the blood, skin, hair, and nails. These ingredients will be enough for 4-6 people. Now it’s preparation time! First of all, clear your schedule for 20 minutes. Then get a medium bowl and throw in beans, vinegar, oregano, thyme, salt, and pepper. Next: Mash beans to get a sort of sauce, but leave some texture in the mixture. Spread the bean mixture over the Boboli® pizza crust. Put tuna, red peppers, and tomatoes on top. Sprinkle cheese over all and it’s ready to go into the oven. Enjoy it with your family! I’m back with a new mouth-watering emergency food recipe from busycooks.about.com. Today, it’s a salmon and potato salad I’ve just tried a couple hours ago. My wife wanted to cook something light for dinner and she was thinking of preparing a quick salad. But here’s a thing about salads: they’re very healthy and tasty, but they don’t give you the impression you’re “full”. I don’t know about you, but I get hungry really fast after eating a salad. So I thought… how about cooking a salad that’s also full? 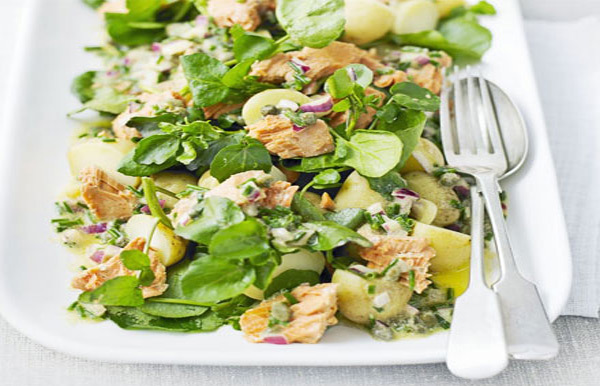 And I found this great salmon and potato salad recipe: it’s very easy to make, light and nutritious. So you get to satisfy your hunger, but also have a good night sleep. 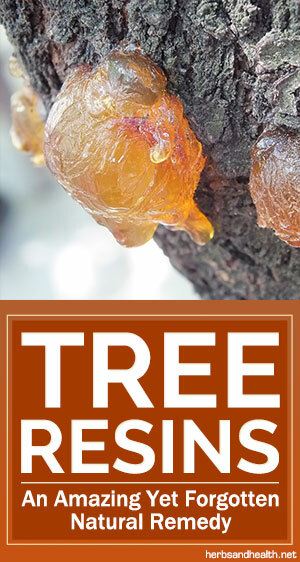 • Relieves joint pain and swelling. The omega-3 fatty acids prevent inflammation, relieve pain and support healthy joint cartilage and other types of tissue. • Makes you smarter and happier. Salmon contains a substance called docosahexaenoic acid (DHA), which is the most important fat found in the brain. This fatty acid helps your brain work better and faster… and it reduces chances of depression. • Prevents cancer. That’s due to Vitamin D and selenium, which play a crucial role in lowering the risk of several types of cancer, including breast, prostate, and colorectal cancer. • Improves your sight. Thanks to fish oil, your eyes will be healthy for a longer time. Good-bye, macular degeneration and chronic dry eye! • Protects your heart. Eating salmon will keep your heart strong and protected from cardiovascular problems, such as heart attack, stroke, heart arrhythmia and high blood pressure. • Helps you look young and beautiful. The omega-3s keeps the skin nourished and hydrated encourages collagen production and gives you an elastic, healthy-looking skin. Also, it keeps blemishes away, makes your hair shiny and your nails strong. Now that you know how many problems you can solve simply by eating salmon two or three times a week, let me show you how you can turn all these benefits into a delicious salad. For preparation, you’ll need 20 minutes, a large bowl and a small one. In the large ball, you’ll mix potatoes, red bell pepper, onion, and salmon. In the small bowl, whisk together oil, parsley, vinegar, pickles, hot sauce, salt, pepper, and thyme; then pour it over the potato mixture and toss to coat. You can serve immediately or cover and chill 2-4 hours before serving. Today’s Emergency Food Recipe is deliiiicious and embarrassingly easy. busycooks reveals the secrets to making a perfect butter bean salad in no more than 15 minutes.’ And the best part is: you can cook this meal pretty much anywhere: at home, when you’re out of time, or outdoors, when you’re camping or when there’s no power source. But besides being versatile and easy to make, it’s also very nutritious and great for your health. Butter-beans have little-known benefits that help your body work at its best, with almost no effort at all. … butter-beans have tiny amounts of fat. 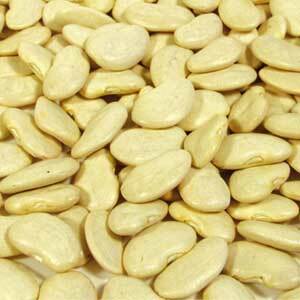 … butter-beans are high in calories. … butter-beans are also high in iron. Actually, they’ve got a quarter of the daily recommended dose. But why is iron so important for you? Well, iron helps your body get oxygenated. This way, you’ll think faster and clearer, your blood will be healthy and you’ll avoid that annoying feeling of weakness at the end of the day. If you want more protein, just add some chicken or fish (especially tuna). Now it’s time to mix everything in a large bowl. First, mix vinegar, olive oil, salt, pepper, and some parsley. Then add the rest of ingredients and toss to coat. Cover the bowl and put it in the fridge for an hour or two. But you can also serve it right away, together with your family. It will be more than enough for 4 people. Can’t wait to hear your opinion about it! Hope you really like it.